“Reparations must be made,” Joe Doucett (Josh Brolin) is warned by a man calling himself ‘The Stranger’ (Sharlto Copley) at the other end of an iPhone that was given to Joe that he barely knows how to use but reparations for what, Joe Doucett has no idea. Having been kidnapped and held captive in a monitored hotel room-like prison for twenty years with nothing but a television available to fill him in on the events occurring in the outside world, Joe has dedicated the remainder of his life to figuring out the identity of the man who placed him there and why. But as the formerly selfish, manipulative adman who lied for a living realizes far too late, the real mystery isn’t why he was taken but why he was released as those reparations come back to the forefront in the film’s final act. Awakening in the middle of a field in an oversized Louis Vuitton trunk with the aforementioned phone in his pocket along with a wad of cash and sunglasses to shield his eyes from the daylight he hasn’t seen in so long, Joe emerges in a fast-paced, technologically advanced world, physically drained but mentally ready for revenge. Having been framed for the brutal murder of his ex-wife when his DNA was collected and planted without his knowledge – in addition to finding the person who’d ruined his life and killed his wife, he’s determined to track down his now-grown daughter whose fleeting image he’s seen on true crime television specials over the years. Though he’d barely made time for his daughter before his capture, in addition to the objects he’s been given, Joe carries with him the only thing he possesses that's of significance from his time away in the form of a pillowcase full of letters he’d written to his daughter over the years. In fact, it was only after seeing a brief video of her playing the cello on TV that Joe cleaned up his act and made the change from from a prisoner who’d given in and hit rock bottom to transforming into a dedicated man on a mission by giving up alcohol and getting into shape to prepare himself for the release he somehow knew would come. 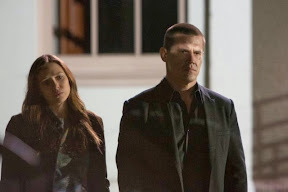 Relying on a childhood friend (played by Michael Imperioli) as well as a beautiful young community health worker (Elizabeth Olsen) who has overcome her own difficulties, Joe sets out on a journey of his past to find The Stranger that’s determined to control his fate. A visceral piece of pulse-pounding revenge cinema, Spike Lee’s Oldboy feels like a '70s era exploitation tinged remake of the 2003 Korean word-of-mouth arthouse smash by the same name from director Chan-wook Park. And while this no-holds-barred picture’s attention to lurid detail ensures that all of the shocking revelations and thrills found in the original show up in some form or another, it doesn’t have the same sense of urgency that the previous film did. In Lee’s hands, you feel as though you’re being pulled in way too many directions at once and while there are a number of fascinating supporting characters that steal focus, it doesn’t have the rawness or immediacy of the original. 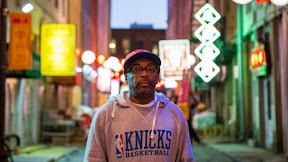 However, to be fair to Lee, there’s no telling how much the final cut of the film is actually the way he’d intended it to be as Oldboy notably lacks his signature stamp of filmmaker approval as a “Spike Lee Joint,” with the credit for the 2013 Sony release listed merely as a Spike Lee Film. While obviously I’m speculating here, knowing what I do about the filmmaker, his oeuvre and in particular his reverence for Budd Schulberg and Paddy Chayefsky (via films such as A Face in the Crowd and Network to which he'd alluded in Bamboozled) and the intriguing use of subjective reality evidenced throughout Doucett’s hotel room television, I wondered if he was aspiring to play up this angle. Given the final act of the film’s argument that people believe what they see on television, I was curious if he was hoping to add a new pop cultural commentary or satirical spin to what would otherwise be simply a straightforward American remake of a foreign hit. Though the controversial Greek tragedy worthy twist remains, while all in all, the 2003 work is superior, Lee’s film actually gives Oldboy a darker, more daring, yet eerily fitting conclusion that once again comments on crime, reparations and punishment and will perhaps play even better to Western audiences. An unlikely addition to Lee’s filmography as it currently stands, while I would certainly love to see his definitive cut of the film, unfortunately besides yet another riveting turn by chameleon-like actor Josh Brolin and some intriguing pop cultural issues that could make for fascinating post-film discussion, there’s not a lot left to recommend in this new look at cinema’s Oldboy.